No need to get upset. I was simply offering you a bit of marketing advice. 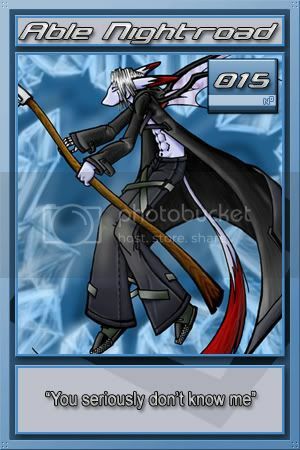 I need to receive my character artwork from Zeru before I can actually request a custom card, so I will send you the information then. I'm a tad curious, but can we actually battle with these cards? Didn't know if it was some kind of TCG game or something. Bow down to your God. Yeah r these just for display? or can we use them to battle? MisterGod wrote: I'm a tad curious, but can we actually battle with these cards? Didn't know if it was some kind of TCG game or something. Well, this is a great question... but not... yet. Well, actually, these cards are for battling. I created the card shape long time ago, with some buddies. I even created a online battling system, but never made it online. But I have great news! I was planning to anounce later, but I am RIGHT NOW making the last touches on K.O. TCG. This re-make version is easier and also better than the first. Believe me, you all are gonna enjoy it. Okee Dokee if you say so, oh yeah is my card almost done? How much it cost for a custom card? I'll pay 10,000 if I can get it with the chosing of my stats and information. Able Nightroad wrote: Okee Dokee if you say so, oh yeah is my card almost done? your card is already done, but I'm on a lan house right now. my pc is without net, then, please wait a bit. I will post it next time I get some acess that I can upload sutff. I got my card!!!!!!! YEAH!!!!!! Hey! I still want my card, what about me? Is it back up? CAn he work on em now?